An individual’s hearing loss can vary depending on the pitch (frequency) of the sounds being heard. HEARnet Online’s Interactive Ear provides a quick and easy visual guide to explanation the different types of hearing loss and the range of technologies available to help manage it. Auditory Processing Disorders occur when the brain has problems processing the information contained in sound, such as understanding speech and working out where sounds are coming from. Conductive Hearing Loss occurs when there is a problem with the Outer or Middle Ear which interferes with the passing sound to the Inner Ear. It can be caused by such things as too much earwax, Ear Infections, a punctured eardrum, a fluid build-up, or abnormal bone growth in the Middle Ear such as Otosclerosis. It is more common in children and indigenous populations. Surgery and some types of hearing technologies can be used to treat Conductive Hearing Loss such as Bone Conduction Hearing Aids, Bone Anchored Hearing Devices and Middle Ear Implants. Sensorineural Hearing Loss occurs when the hearing organ, the Cochlea, and/or the auditory nerve is damaged or malfunctions so it is unable to accurately send the electrical information to the brain. Sensorineural Hearing Loss is almost always permanent. It can be genetic or caused by the natural aging process, diseases, accidents or exposure to loud noises such as Noise-induced Hearing Loss and certain kinds of chemicals and medications. Auditory Neuropathy is another form where the nerves that carry sound information to the brain are damaged or malfunction. 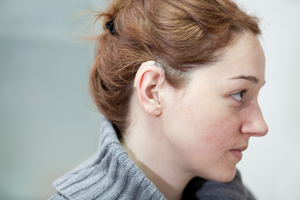 Technologies such as Hearing Aids, Cochlear Implants and Hybrid Cochlear Implants can help reduce the effects of having Sensorineural Hearing Loss. A Mixed Hearing Loss occurs when both Conductive Hearing Loss and Sensorineural Hearing Loss are present. The sensorineural component is permanent, while the conductive component can either be permanent or temporary. For example, a Mixed Hearing Loss can occur when a person with Presbycusis also has an Ear Infection.